There is no denying it, we are in the middle of an indoor plant boom. If you’ve got an empty corner, fill it with a plant! 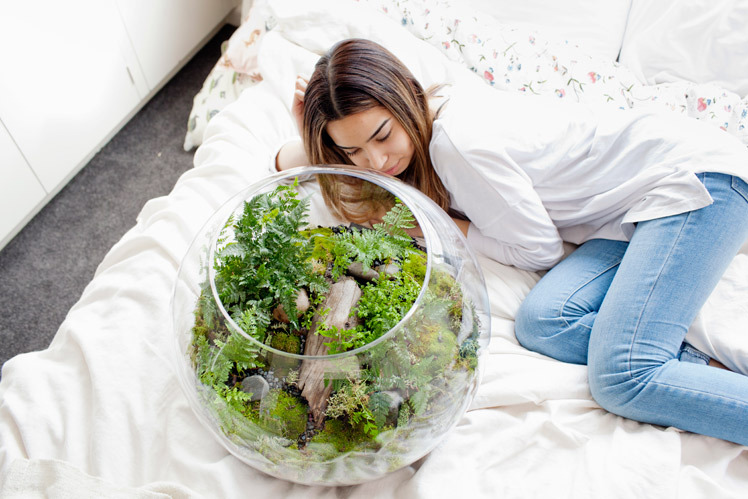 The clever cats behind Plant by Packwood, Bayden and Charlotte, make your plant dreams easy with their no-fuss terrariums. Discover more at our Melbourne AW15 Market this weekend! Tell us about your label Plant by Packwood and what the concept is behind it? 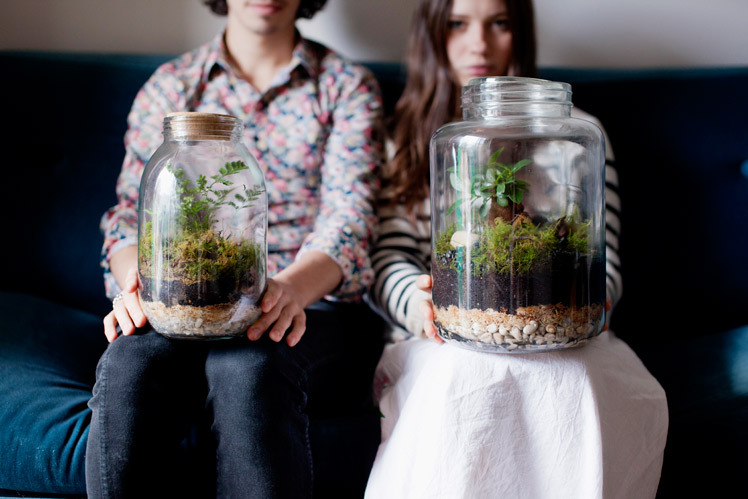 Plant by Packwood create artisan terrariums for city people who need somewhere small to retreat to. We (Bayden and Charlotte) live in a small Brunswick apartment but crave the peace and creativity we find in the dreamy landscapes far from the CBD. 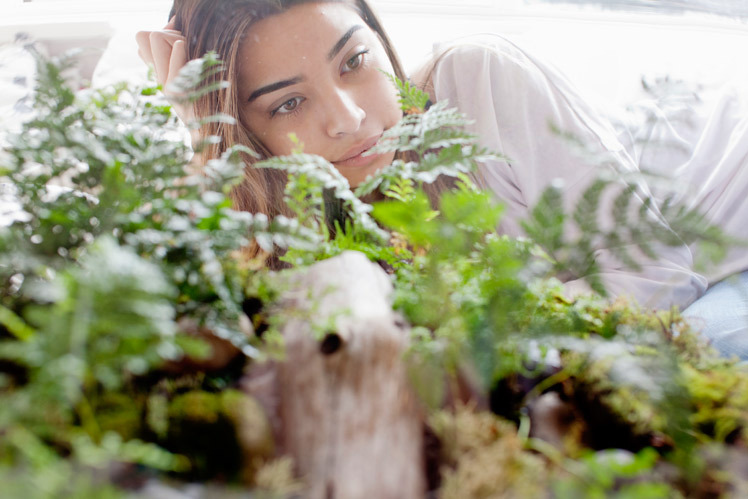 PLANT was born from our desire to reconnect with the natural world. Every PLANT terrarium is unique, and inspired by aspects of nature that we tend to miss while rushing from one closed space to the next. We construct beautiful, ever-changing environments you can bring into any space and escape to when you need a breath of fresh air. 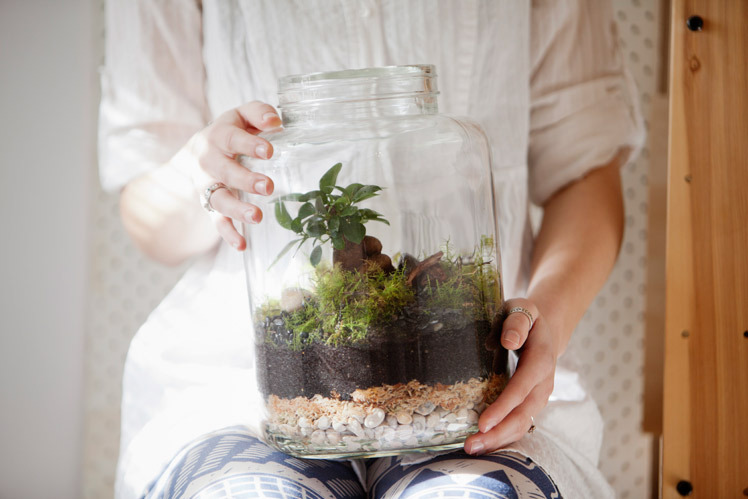 As a bonus – all our terrariums are self-sufficient, which means you don’t have to water or care for them! As long as they get a little sunlight each day, they thrive on independence and evolve into beautiful unique little jungles. What is your creative backgrounds and how did it lead you both to where you are today? We are Bayden Packwood Hine – a folk musician from the country, and Charlotte Nicdao – an actress from the city. We’ve both come from a creative background – but while Bayden has a decidedly green thumb, Charlotte has always had a little trouble keeping anything remotely green alive. 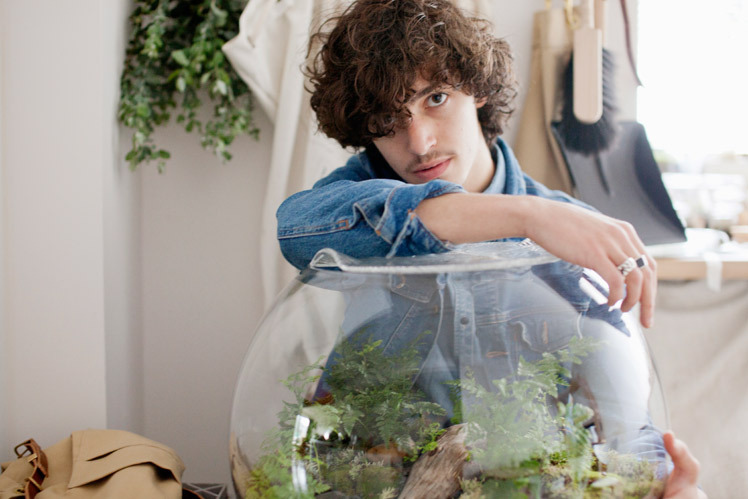 On Valentine’s Day of 2014, Bayden, tired of giving Charlotte plants which she would inevitably kill, made her a terrarium– a little houseplant she wouldn’t have to remember to water; and Plant by Packwood was born! What do you love about working with plants? What keeps you creatively motivated? We love how plants are each totally unique, and are constantly on the look out for new exciting things to include in our range. A lot of our pieces have similar minimalist designs, such as our Oasis Plant – a large jar with a single bonsai fig tree in a garden of moss. It’s through this minimalism that you discover the subtle differences between each tree – and how sculptural and interesting and incredible beautiful the variations are. We love discovering the beauty in each piece with our customers, who sometimes take more than an hour to choose which Plant is right for them! Getting to see each piece through new eyes with our customers is one of the best and most inspiring parts of the job. 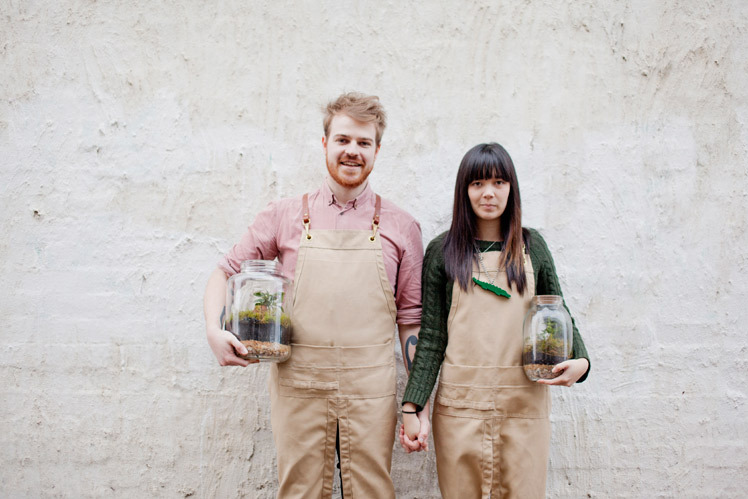 We create all our terrariums and run Plant by Packwood from our little apartment in Brunswick. Bayden has a workspace in our courtyard, a custom build wooden bench with all his materials stacked around. We keep all our plant seedlings in the house along with the terrariums which are still settling – it’s a bit of a green paradise here! Bayden approaches each new terrarium with fresh eyes, and uses the natural structure of the plants and soil to inspire the design. Sometimes he’ll have a clear idea of what he wants to build, and it will be totally overturned by a particularly amazing fittonia plant, or the way the terrain settles in the jar. Running our own label usually seems to be nothing but fun, but admittedly – being a couple in business together can be tough at times, mostly because we sometimes have to remind ourselves to talk about something other than Plant, we’re both so obsessive and proud! Luckily we’re pretty much always on the same wavelength and equally enthusiastic about what we do, which makes overcoming challenges a breeze. We love that we get to fill our days with something we love and are passionate about, we don’t have some cranky old boss to answer to and we get to choose the directions we move in creatively. Our client-base is also super, super lovely. Meeting new people at markets is so much fun, and we love doing home deliveries and seeing just how what we make is going to click into someone’s space. What can we expect to see from Plant by Packwood at the upcoming Melbourne Markets? We’ll have all our best selling pieces, from itty-bitty tiny moss jars to those large Oasis Plants with the bonsai figs. 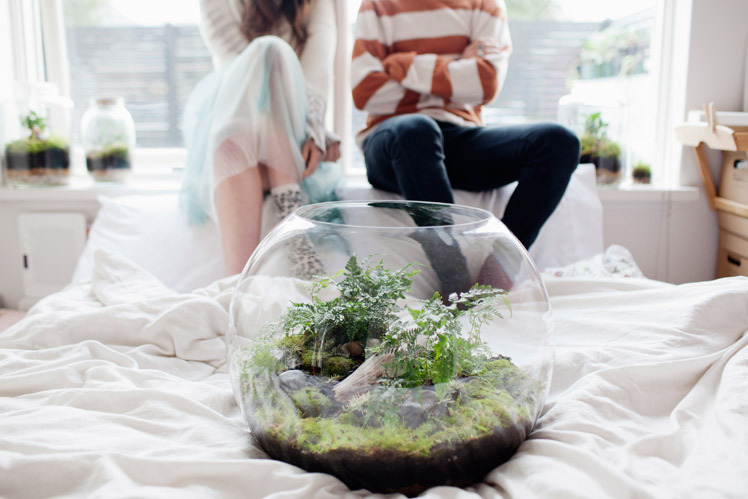 Bayden will also be taking pre-orders for personally designs terrariums in our signature giant glass bowls. 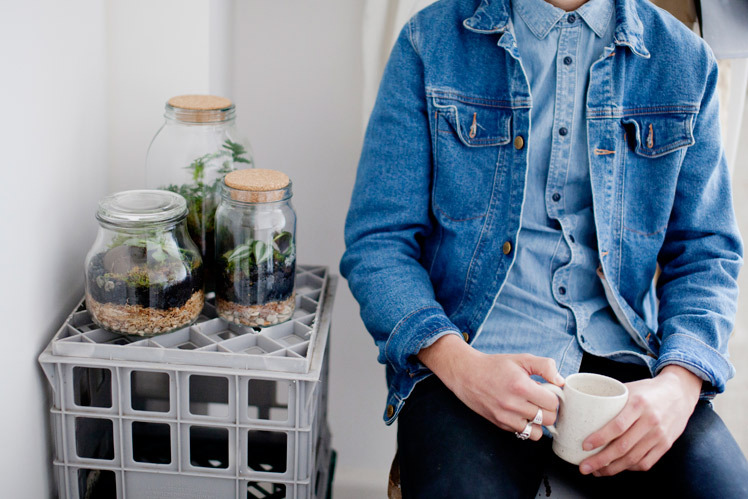 You can pop by and have a sit down with him where he’ll take you through all the different plants you can choose to include, you can decide on the aesthetic of your landscape and come up with something that is perfect for you.